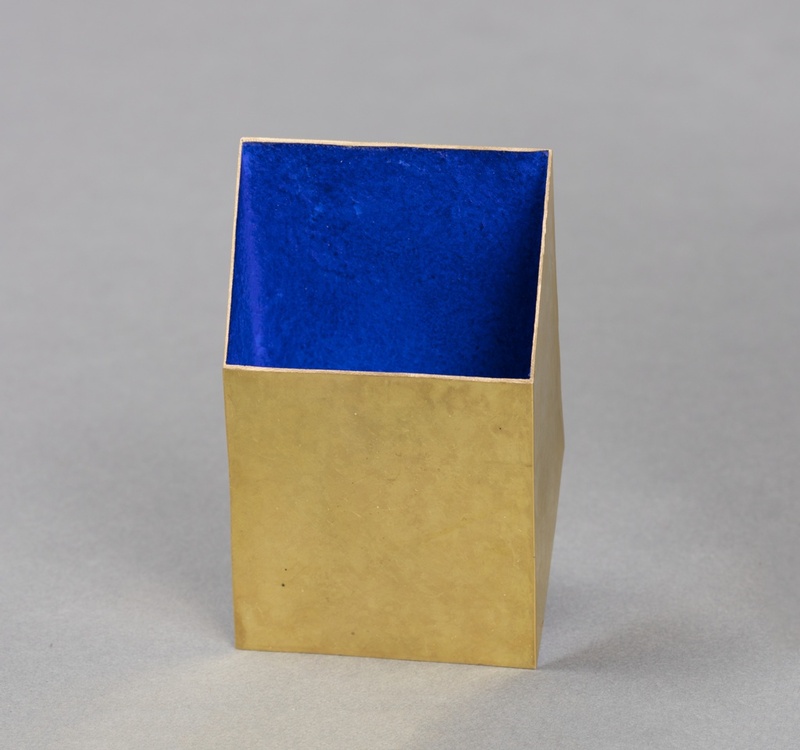 Folded into an open rhombus, and richly adorned with pigment, this brooch boldly uses color (achieved with the application of cobalt blue pigment) and texture (achieved by stippling the gold) to enhance its form. One look at this brooch by Giampaolo Babetto provides evidence of the mastery of gold present in his work. Babetto’s pieces cleverly transform shape and surface while paying homage to gold as a substance. His jewelry is characterized by the clean lines of geometric form and a soberness resulting from lack of ornamentation. Babetto prefers working with gold due to its stable malleability and warm sheen, which he sometimes combines with unconventional materials such as plastic or glass, dusting the surface with a velvet-like pigment in luminous reds or blues, or by using enamel or niello-based techniques. He has been classified as a mixed media artist, and works not only in the area of jewelry but also in furniture design, silver, and architectural projects. His body of work reflects the uncompromising demands he places on his own handling of the various design disciplines, and his love of experimentation. Born in Padua, Italy, in 1947, he studied at the Istituto d’Arte Pietro Selvatico in Padua and at the Accademia di Belle Arti in Venice. The special nature of the jewelry created by Babetto and his contemporaries who attended the Istituto has led experts to refer to the group as the Padua School. The Padua School denotes a specific approach, following the lead of jewelry designer, goldsmith and Istituto instructor, Mario Pinton, who inspired several generations of contemporary designers. The Istituto maintained Pinton’s creative and academic principles into the 1960s and later, training an impressive group of artists including Babetto, Stefano Marchetti, Renzo Pasquale, Graziano Visintin and Annamaria Zanella. Babetto is foremost of this group; he not only joined the Istituto staff, continuing and strengthening the jewelry program, but brought the school international recognition with work that has been noted for its sensitivity and precision. Babetto has stated that his work is not “made for appearances” but is something that comes from within, and thus expresses an inwardness. Not limited by process or materials, and with a sharp eye for detail, he explores a wide range of forms, volumes and color resulting in pieces which he considers gems. Gems that are completed by being worn.